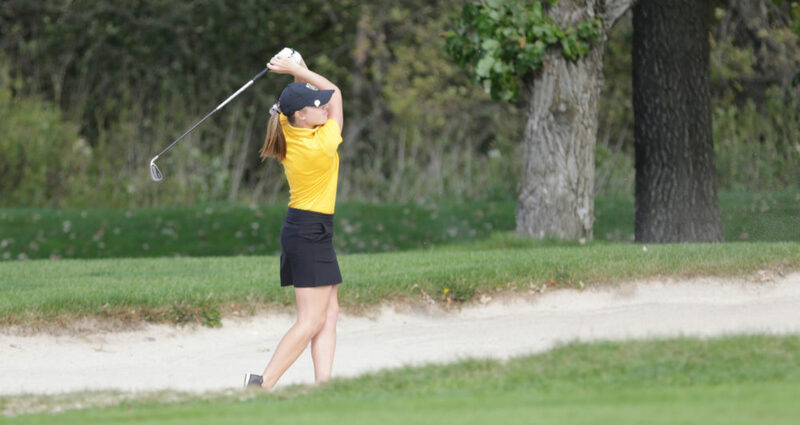 SARTELL, Minn. – The Gustavus women’s golf team finished their first day of play at the CSB Invite in second place out of 13 teams. The Gusties posted a score of 314 on the day which trails only Cartleton who carded a 297. Morgan Bleyhl (Jr., Elk River, Minn.) led the Gusties on the day and finished with a score of 76 which was good for sixth place overall. Erin Ericson (Fy., Onalaska, Wis.) started her collegiate career off on the right foot by carding a 78 which was good for 9th place overall on the day. Sydney Regalado (Fy., Rosemount, Minn.), Emily Kratz (Fy., Edina, Minn.), and Ellie Brandt (Sr., Wayzata, Minn.) all put together rounds of 80 to round out the top five for the Gusties. Kennedy Sommerfeld (Sr., Litchfield, Minn.) also played well on the day as she finished with a round of 81. The Gusties will look to keep the pressure on Carleton tomorrow and improve on their score from today as they compete in day two of the CSB Invite. “I’m really looking forward to our team getting back at it again tomorrow,” coach Moe said.